TH E M R EP O RT | 41 O R I G I NAT I O N S E R V I C I N G A NA LY T I C S S E C O N DA R Y M A R K E T ORIGINATION THE LATEST Mortgage Access Becoming More Prevalent Among Blacks & Hispanics Mortgage denial rates are down and the percentage of U.S. mortgage applicants getting approved has increased for all borrowers, but most notably among the black and Hispanic races. E ased credit access is allowing more people to be eligible for mortgage loans, especially among middle-income blacks and Hispanics, but despite the uptick, they still lag behind in the housing market recovery. Mortgage denial rates are down and the percentage of U.S. mort - gage applicants getting approved has increased for all borrowers, but most notably among the black and Hispanic races, according to Zillow's analysis of mortgage ac - cess and homeownership by race. Zillow noted that this indicates "that easing mortgage restrictions are making it easier for more Americans to become homeown - ers." However, this progression does not mean these races have fully recovered from crisis times. Zillow reported that despite notable differences in lending to black and Hispanic borrowers, they still lag behind whites and Asians in the housing recovery. In 2013, 27.6 percent of blacks who applied for a conventional home loan did not get approved, while in 2014, 23.5 percent were denied, according to the most recent federal data released under the Home Mortgage Disclosure Act. Overall, in 2013, the denial rate was 12.4 percent and fell to 11.2 percent in 2013. 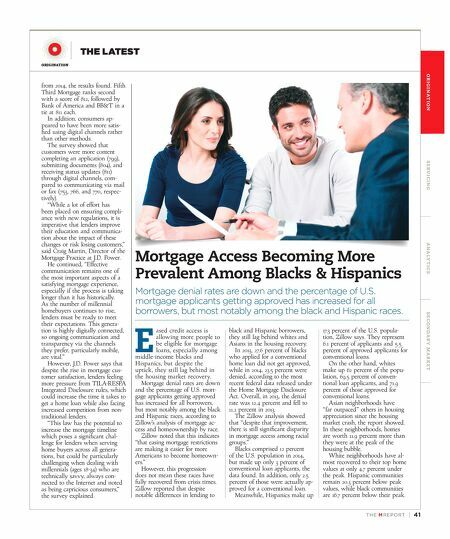 The Zillow analysis showed that "despite that improvement, there is still significant disparity in mortgage access among racial groups." Blacks comprised 12 percent of the U.S. population in 2014, but made up only 3 percent of conventional loan applicants, the data found. In addition, only 2.5 percent of those were actually ap - proved for a conventional loan. Meanwhile, Hispanics make up 17.3 percent of the U.S. popula- tion, Zillow says. They represent 6.1 percent of applicants and 5.5 percent of approved applicants for conventional loans. On the other hand, whites make up 62 percent of the popu - lation, 69.5 percent of conven- tional loan applicants, and 71.9 percent of those approved for conventional loans. Asian neighborhoods have "far outpaced" others in housing appreciation since the housing market crash, the report showed. In these neighborhoods, homes are worth 11.9 percent more than they were at the peak of the housing bubble. White neighborhoods have al - most recovered to their top home values at only 4.7 percent under the peak. Hispanic communities remain 20.3 percent below peak values, while black communities are 16.7 percent below their peak. from 2014, the results found. Fifth Third Mortgage ranks second with a score of 812, followed by Bank of America and BB&T in a tie at 811 each. In addition, consumers ap - peared to have been more satis- fied using digital channels rather than other methods. The survey showed that customers were more content completing an application (799), submitting documents (804), and receiving status updates (811) through digital channels, com- pared to communicating via mail or fax (753, 766, and 770, respec- tively). 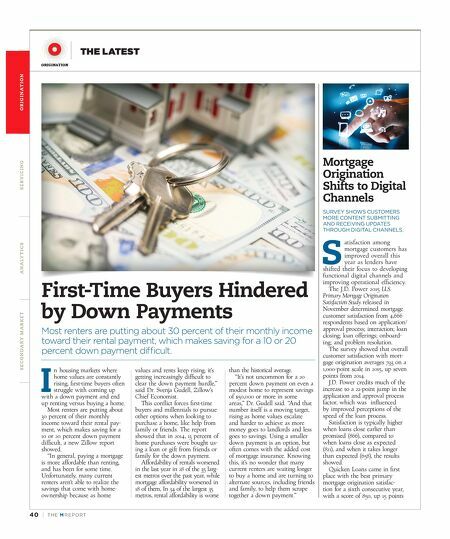 "While a lot of effort has been placed on ensuring compli- ance with new regulations, it is imperative that lenders improve their education and communica- tion about the impact of these changes or risk losing customers," said Craig Martin, Director of the Mortgage Practice at J.D. Power. He continued, "Effective communication remains one of the most important aspects of a satisfying mortgage experience, especially if the process is taking longer than it has historically. As the number of millennial homebuyers continues to rise, lenders must be ready to meet their expectations. This genera- tion is highly digitally connected, so ongoing communication and transparency via the channels they prefer, particularly mobile, are vital." However, J.D. Power says that despite the rise in mortgage cus- tomer satisfaction, lenders feeling more pressure from TILA-RESPA Integrated Disclosure rules, which could increase the time it takes to get a home loan while also facing increased competition from non- traditional lenders. "This law has the potential to increase the mortgage timeline which poses a significant chal- lenge for lenders when serving home buyers across all genera- tions, but could be particularly challenging when dealing with millennials (ages 18-34) who are technically savvy, always con- nected to the Internet and noted as being capricious consumers," the survey explained.